May 2018 is the launch window for NASA’s next mission to Mars, the InSight Lander. InSight is the next member of what could be called a fleet of human vehicles destined for Mars. But rather than working on the question of Martian habitability or suitability for life, InSight will try to understand the deeper structure of Mars. InSight stands for Interior Exploration using Seismic Investigations, Geodesy and Heat Transport. InSight will be the first robotic explorer to visit Mars and study the red planet’s deep interior. The work InSight does should answer questions about the formation of Mars, and those answers may apply to the history of the other rocky planets in the Solar System. The lander, (InSight is not a rover) will also measure meteorite impacts and tectonic activity happening on Mars currently. This video helps explain why Mars is a good candidate to answer questions about how all our rocky planets formed, not just Mars itself. InSight was conceived as part of NASA’s Discovery Program, which are missions focused on important questions all related to the “content, origin, and evolution of the solar system and the potential for life elsewhere”, according to NASA. Understanding how our Solar System and its planets formed is a key part of the Discovery Program, and is the question InSight was built to answer. To do its work, InSight will deploy three instruments: SEIS, HP³, and RISE. This is InSight’s seismic instrument, designed to take the Martian pulse. It stands for Seismic Experiment for Internal Structure. SEIS sits patiently under its dome, which protects it from Martian wind and thermal effects, and waits for something to happen. What’s it waiting for? For seismic waves caused by Marsquakes, meteorite impacts, or by the churning of magma deep in the Martian interior. These waves will help scientists understand the nature of the material that first formed Mars and the other rocky planets. HP³ is InSight’s heat probe. It stands for Heat Flow and Physical Properties Probe. Upon deployment on the Martian surface, HP³ will burrow 5 meters (16 ft.) into Mars. No other instrument has ever pierced Mars this deeply. Once there, it will measure the heat flowing deeply within Mars. Scientists hope that the heat measured by HP³ will help them understand whether or not Mars formed from the same material that Earth and the Moon formed from. It should also help them understand how Mars evolved after it was formed. RISE stands for Rotation and Interior Structure Experiment. RISE will measure the Martian wobble as it orbits the Sun, by precisely tracking InSight’s position on the surface. This will tell scientists a lot about the deep inner core of Mars. The idea is to determine the depth at which the Martian core is solid. It will also tell us which elements are present in the core. Basically, RISE will tell us how Mars responds to the Sun’s gravity as it orbits the Sun. 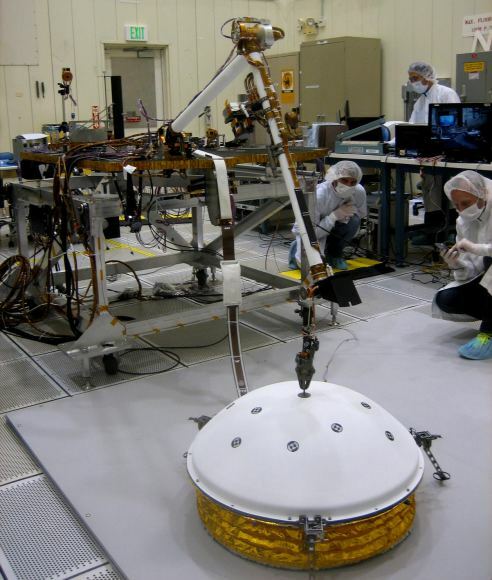 RISE consists of two antennae on top of InSight. InSight will land at Elysium Planitia which is a flat and smooth plain just north of the Martian equator. This is considered a perfect location or InSight to study the Martian interior. The landing sight is not far from where Curiosity landed at Gale Crater in 2012. InSight will be launched to Mars from Vandenberg Air Force Base in California by an Atlas V-401 rocket. The trip to Mars will take about 6 months. Once on the Martian surface, InSight’s mission will have a duration of about 728 Earth days, or just over 1 Martian year. InSight won’t be launching alone. The Atlas that launches the lander will also launch another NASA technology experiment. MarCO, or Mars Cube One, is two suitcase-size CubeSats that will travel to Mars behind InSight. Once in orbit around Mars, their job is to relay InSight data as the lander enters the Martian atmosphere and lands. This will be the first time that miniaturized CubeSat technology will be tested at another planet. If the MarCO experiment is successful, it could be a new way of relaying mission data to Earth. MarCO will relay news of a successful landing, or of any problems, much sooner. However, the success of the InSight lander is not dependent on a successful MarCO experiment.